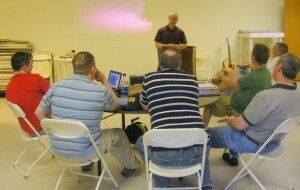 Tom Hocking leads the opening session of the Northwest Focus retreat on Friday night. Rain gave way to clear skies as the Northwest Focus retreat began last night at Camp Clear Lake in Washington State. About 20 pastors and laymen from around the state and southwestern British Columbia gathered for two days of fellowship and refreshment. Tom Hocking, pastor of the Bellflower Brethren Church and moderator of the Fellowship of Grace Brethren Churches, led the men in a discussion of John 17. As with other Focus Retreats, the sessions began with 10 hours of solitude and silence. On Tuesday, the morning began with a discussion of lessons learned during the hours of silence. Then Tom Avey, coordinator for the Fellowship of Grace Brethren churches, spent some time talking about the discipline of fellowship. The retreat concludes tomorrow at Camp Clear Lake.